We welcome you to explore each of the houses. Some houses are close enough for a comfortable bike ride or walk to each other. Please refer to our maps to guide you. Below are directions, maps and downloadable information to guide you towards each house and to plan your day. Arriving by car is the preferred transportation --- all houses have FREE PARKING! 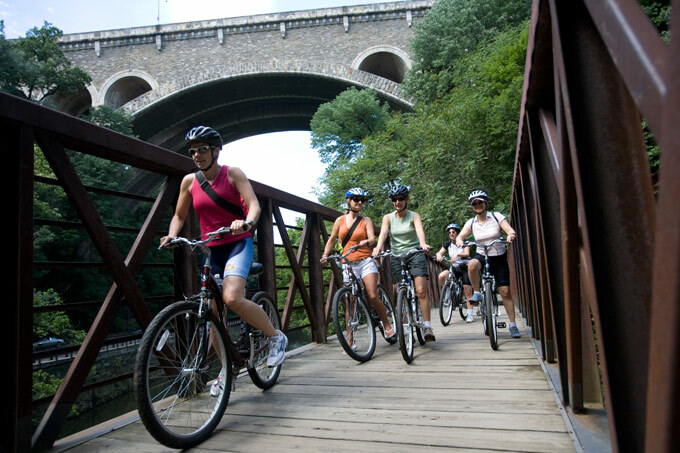 Fairmount Park is a lovely recreational area for walking, biking, jogging and other activities. Note: Access to Kelly Drive is affected by special events in Fairmount Park, particularly Regattas. Check this link for information from Fairmount Park regarding Kelly Drive planned closures for events. The Charms of Fairmount Park are accessible by public transit for visitors who are willing to do some easy to moderate walking through an urban park. The three closest houses to the bus routes are less than a ¼ mile walk and include Woodford, Strawberry Mansion and Lemon Hill. The houses that require the most walking include Mount Pleasant and Laurel Hill. In the directions below, you will see transit information noted. Please visit www.septa.org for fare, schedule and route information. Detailed directions from your point of origin can be obtained using SEPTA’s Trip Planner, using the house addresses listed below. Walking: If you would like to visit to most of the houses on one walk, the East Fairmount Park Houses Walking Route is a 3.8 mile route which follows the historic Boxers Trail, which is the trail that Joe Frazier ran while training to fight Muhammad Ali. This trail connects you to all of the open houses on the east side of the river except for Lemon Hill. The sum of the whole is this: walk and be happy; walk and be healthy. For Driving Directions and information regarding public transit access from the Please Touch Museum to Cedar Grove click here. - Take SEPTA Bus 54 or 32 to 33rd and Dauphin St.
- The Boxer’s Trail Gateway is across the street in the park from the bus shelter. - Follow signs approximately .5 miles to Laurel Hill Mansion. - Take the 32 to the intersection of Poplar St. and Poplar Dr.
- Walk left on Poplar Drive and follow to Lemon Hill Drive. Turn right up Lemon Hill Drive. - Lemon Hill is located at top of hill. - Take Trolley to intersection of Girard Ave. and Poplar Dr.
- Follow Poplar Drive to Lemon Hill Dr. Follow Lemon Hill Drive to mansion. Turn right up Lemon Hill Drive. For Driving Directions to Mount Pleasant click here. - Take SEPTA Bus Route 54 and 32 to 33rd and Reservoir Dr.
- Follow Reservoir Drive to Mount Pleasant Drive approximately .5 miles. - You will pass the Frisbee golf course and Smith Memorial Playhouse on your left. - At the intersection of Reservoir Drive and Mt. Pleasant Drive turn slightly left. - Follow Mount Pleasant Drive up the hill. - Take SEPTA Bus Routes 32, 54 or 61 to 33rd and Dauphin St.
- Follow signs approximately .3 miles to Strawberry Mansion (just past Woodford). - Follow path ½ block to Woodford’s entry gate. - Cross Kelly Drive to Sedgeley Dr. at lighted intersection. Proceed north (approx .2 mile) to Lemon Hill Drive (first left). Follow to Lemon Hill Mansion at top of hill. - Make left onto Mount Pleasant Dr. and follow to Mount Pleasant. - Turn Left onto Randolph Dr. Follow .2 miles to Laurel Hill Mansion. - To Continue to Woodford Mansion from Laurel Hill Mansion turn left and choose to follow either Randolph Drive or the Boxers Trail (path adjacent to the road) out to the intersection at Strawberry Mansion Bridge Drive. - Proceed straight across intersection (look for the landmark Indian equestrian statute) Woodford’s entrance is on left .3 miles) just prior to reaching the intersection at 33rd and Dauphin. - To continue to Strawberry Mansion turn left as you are exiting Woodford continue on street or paved Boxers Trail. Proceed straight across intersection .4 miles to Strawberry Mansion located at the end of the lane. - Turn right from Lloyd Hall and proceed towards the Fairmount Water Works. Follow Schuylkill River Trail bike path through the Fairmount Water Works site, under Spring Garden Street Bridge to intersection at MLK Drive. Turn right onto sidewalk at MLK Drive. Note this path is very narrow and not for inexperienced riders. - Follow MLK bike path past lighted intersection at Sweetbriar Drive to Black Road. (It will be your fist left beyond Sweetbriar Drive. There is no stoplight). Exit bike path and carefully cross MLK Drive. - Proceed up steep hill on Black Road. Make first left and another quick left following signs to Cedar Grove.